“The best pizza in the Bay Area,” San Francisco Chronicle‘s Michael Bauer proclaimed. I had heard so much about the pizza at Pizzeria Picco that I had to go check it out for myself. My friend Jen and I settled into a table at the outdoor deck on a chilly but sunny Saturday afternoon for lunch. 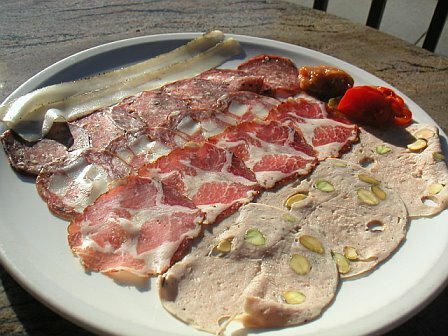 I ordered a plate of the house-made charcuterie selection, which included spongy, nutty mortadella, sweet soppressata and smoky, spicy salumi dusted with fennel pollen. The plate was accompanied by apricot chutney and pickled sweet peppers. 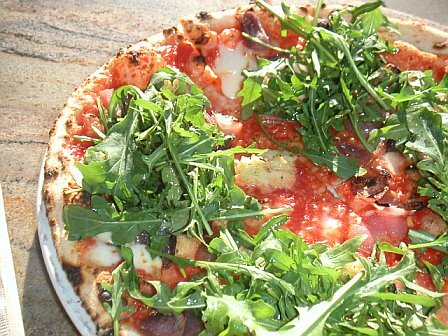 We ordered margherita pizza topped with salt cod and arugula — the pizza of the day. It was a “wet” style pizza, with a sufficient amount of tomato sauce but not too much cheese topping. This was the lightest pizza I’d ever had — the crust wasn’t dense and chewy. Rather, it was soft, with an oh-so-slightly crispiness on the outside. The salt cod was used sparingly (a good thing) and the rocket added a slight bitterness. The tomato sauce was divine — the perfect amount and slightly sweet yet tangy. My only regret was that the pizza got cold too quickly sitting outside, and when it was cold it lost its luster very quickly, turning more chewy than crispy and soggy toward the middle. Pizza of the day: Margherita with Salt Cod, Arugula. The meal wasn’t complete until we sampled the famous olive oil ice cream: organic Straus Dairy vanilla soft-serve ice cream, with DaVero extra virgin olive oil and sea salt sprinkled on top. “Go ahead…you can do this,” the menu urged. After hearing so many raves, I didn’t need any urging. It was the most unexpectedly delicious thing I’ve ever tasted: sweet, yet not cloying; slightly salty; and the fruity, herbaceous flavor of olive oil. This entry was posted on December 13, 2007 at 2:26 am and is filed under pizza, Restaurants, Reviews with tags ice cream, pizza. You can follow any responses to this entry through the RSS 2.0 feed. You can leave a response, or trackback from your own site. Yum! I want to try that ice cream. And I want to join you on a future trip, ok? Did you ever make it to that Afghan restaurant? Of course…you are my next companion! The ice cream is amazing. I did make it to the Afghan restaurant…it was delish but literally a meat locker, it was so cold. That’s what I remember the most! I will have to try it again on a warm day…with you of course! That margherita w/ salt cod looks really amazing…nothing like I’ve ever seen on a pizza. BTW, where is Larkspur? North of Tiburon, by Corte Madera. You are going to have to come along with me next time you are in the Bay Area! This pizza looks amazing. I must eat it. Where can I eat it Susannah? Pizzeria Picco in Larkspur! We have to go sometime. Maybe after your trip to Banff!